Philip Ashley initially trained as a wood machinist and has had over 35 years experience in industry (furniture, cabinets, windows and door manufacture). He has extensive teaching experience and until recently was centre manager of the furniture industry design and innovation (specialist centre) at Holmesglen TAFE Institute in Melbourne. In this role Philip was responsible for the management of five furnishing trades, Joinery and Interior Decoration and Design courses. Philip’s first article appeared in AWR#2 in 1992. Since then he has contributed to every issue of the magazine and written over 120 articles. A list of his stories can be seen in the downloadable author's index. A: Fell into it, really. I was looking for an apprenticeship as a carpenter but was never comfortable walking around ten feet off the ground on a piece of wood three inches wide. I left after a month. I was offered a job as a wood machinist. Didn’t know what a woodmachinist did, but took it on anyway. I spent the first three months of my apprenticeship sweeping floors. A: I really don’t have any heroes in woodworking. I do appreciate anyone who makes a video or writes a book, anyone prepared to share what they know with others or stick their neck out. A: As a woodmachinist I have made the bits and pieces for just about everything. Later on in my career I took up the computerised woodworking machinery and made a name for myself in the Victorian teaching community as a bit of an authority. A: I believe that we can never lose the basics of the trades, but to compete internationally we need to adopt new techniques where we can. There is no doubt that distances are shrinking and that like it or not, we must be part of the broader community. A: Machinery salespeople who tell lies. A: Sorry to be boring, but recently it’s been CNC programming, high-tech tools and stuff like that. A: I re-designed and made eight computer workstations for our Institute a few years back. Each one was for 12 computers in the shape of a three-spoke wheel. That brought me some satisfaction. A: None, I’ll do it again. A: No particular oft-made mistake springs to mind, but I do make them. A: Once I blew three wide belts on a sanding machine in one morning. I’ve also sent the tool on a CNC machine into the table on several occasions. Once it was being filmed for a corporate video but because of the guards, no one noticed (and I never said a word). A: The thing I would most like to change about wood is the splinters. Q: The thing I would most like to change about woodworkers is…. 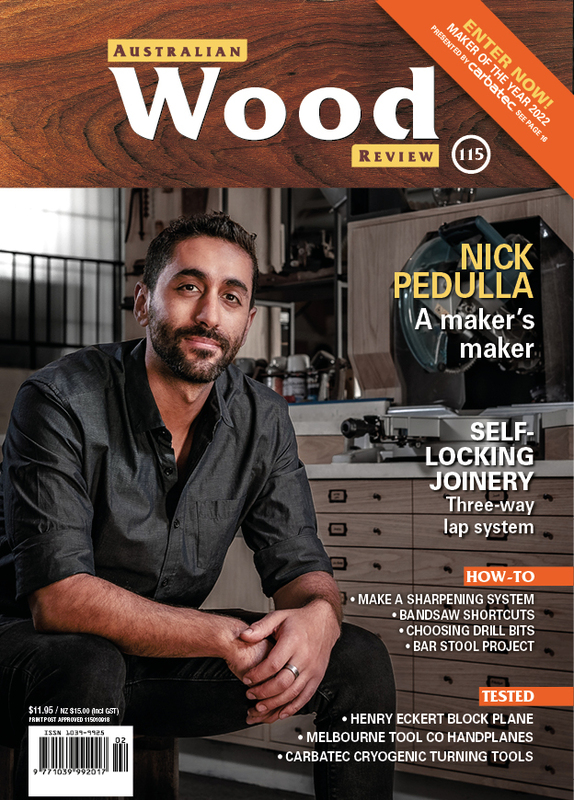 A: The thing I would most like to change about woodworkers is the ‘I know it all’ attitude. No one knows it all. A: The thing I would most like to change about my own woodworking is to get my hands dirty a little more. My role at Holmesglen TAFE was mainly one of management so I'm getting into the workshop more often than I used to. A: My final word on woodwork is to enjoy what you do and keep on learning. You can write to Philip here.